Sorry I have been MIA. I have been super busy due to the last days of school. Now I have 4 children home with me on Summer break. I have been preparing for all of our Summer Family Fun. I have been getting some stamping done, I just couldn't get to the computer to post. On to today's project. This card measures 5x5. The base is Chocolate Chip. I used Riding Hood Red and Very Vanilla card stock as well. The DSP is from Candy Lane. 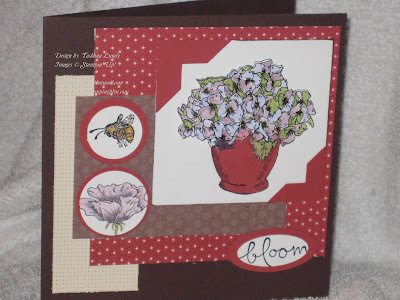 I used the Bloomin' Beautiful stamp set for all the images and sentiment. The main image is paper pieced. The Blender Pens help to create the lovely coloring work on this project. Be sure to check back with me....I have BLOG CANDY coming soon and other great customer specials.